It’s now been over a month since my sister Renatta left St. Louis to go home for the summer. Thanks to constant communication via group text messages and a quick trip home a few weeks ago, not that much has changed, but I do miss having her over for dinner at least once a week. 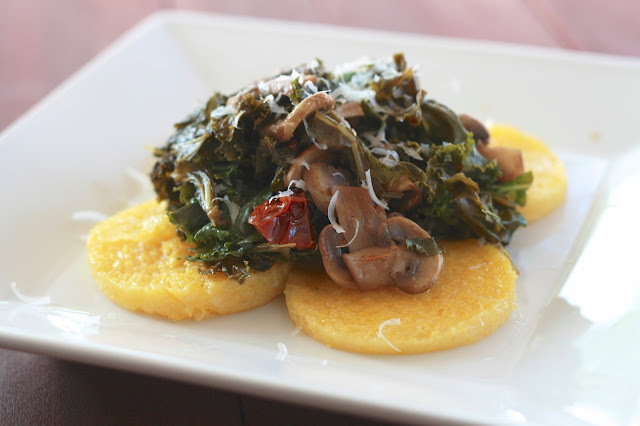 This polenta kale dish was the last meal I made her before her trek home. Her friend Jen came to pick Renatta up from school and after the two of them spent the day packing the car with Natta’s outrageous clothing collection, they headed over to my house. Jen immediately eyed the meal cooking on the stovetop and started asking questions. I explained that no, polenta was not a vegetable and yes, is different than collard greens. I then started to get nervous that perhaps I should’ve thrown together something a little more familiar. Jen squashed my fears a few minutes later when she proclaimed that she trusted me, and had ever since I’d introduced her to black beans a few years earlier. Basically, if I told her it was good, she was willing to eat it. Still, as we sat down to eat, I made her promise not to eat it if she wasn’t a fan. Either Jen’s a good liar or she really did join the kale and polenta fan clubs that evening! I expected Renatta and me to clean our plates but when Jen did too, I knew this meal was something good. Served with cheesy bread (I used this bread, which the girls proclaimed the best ever! ), this was a great light meal to preface our main event: Ted Drewes for dessert! 1. Heat 1 tbsp of olive oil in a large skillet over medium high heat. Add the mushrooms and cook, stirring occasionally, until softened (about 5 minutes). Add tomatoes and cook for another 2 minutes. Stir in kale and 1/4 cup of water. Cover, reduce heat to medium, and cook until kale begins to wilt (about 2 minutes). Stir in balsamic vinegar. Season with salt and pepper and cook until wilted, about 2 more minutes. Cover and set aside. 2. Heat remaining tablespoon of oil in a large nonstick skillet over medium high heat. 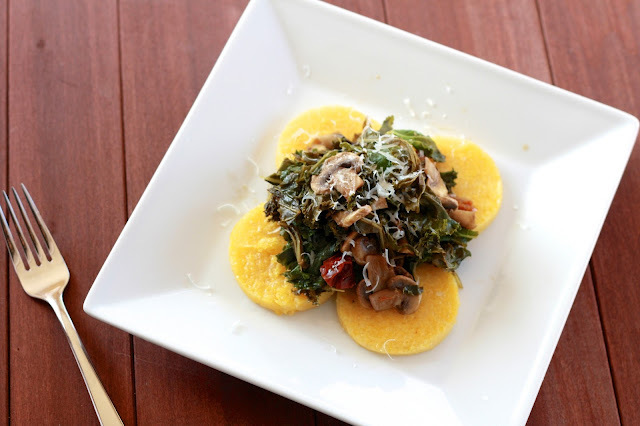 Arrange the polenta in a single layer on the skillet (work in batches, if needed). Cook, flipping once, until golden on both sides (about 3 minutes a side). Transfer polenta to a paper towel lined plate when done. 3. Arrange polenta on plates. Spoon kale mixture over the top. Sprinkle with cheese and red pepper flakes. Serve immediately.